At present, after the completion of installation and commissioning, a 53-berth container terminal of Vladivostok commissioned crane Liebherr. 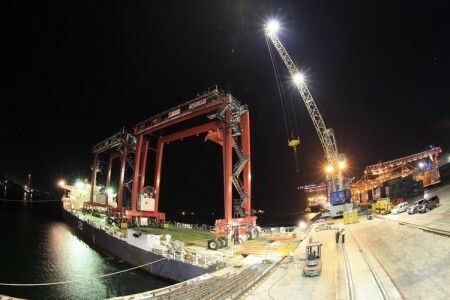 Gantry crane maximum lifting capacity of 124 tons was purchased Sakhalin Shipping Company for the treatment of a 53 berth VMKT vessels servicing import and export lines, including ships, working on lines SCL (SASCO China Line). At the same time, a 50-berth VMKT began operating gantry crane Liebherr, acquired Vladivostok Sea Fishing Port. Crane lifting capacity of 63 tons is designed to handle vessels SASCO, serving the coastal steamship line Vladivostok — Korsakov, Vladivostok — Magadan and Vladivostok — Petropavlovsk-Kamchatsky. Commissioning of these cranes will increase the processing speed of SASCO vessels on both piers, provides fast handling and shipping containers for all shipping lines Shipping.